In a Strange Land: The Phone Book's Here! The Phone Book's Here! Verizon's phone book landed on the porch a day or two ago, and only this morning did I get around to unwrapping the skinny little thing. 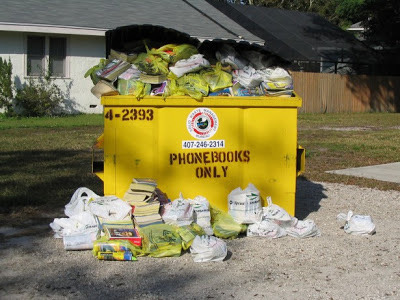 It's like the Ghost of Phone Books Past, to this techno-Scrooge. In another era, the arrival of the new edition would cause quite a flutter. Misplacing the phone book was also unthinkable. They were not easily or cheaply replaced, and my father guarded it like the Dead Sea Scrolls. In an otherwise chaotic Lebanese-American household, the phone book held court on the telephone table. Nowhere else. Now phone books are incomplete and small. Verizon banishes residential listing entirely to a Web page, a crowning irony since most of the land-line stalwarts I know are so old that a broom provides the interface for web access in their homes. Once, however, the phone book provided all sorts of diversions. I've three degrees of separation from musician Frank Zappa, but only one from his phone book. A grad-school friend named Rick, when living in Los Angeles, once had the job of delivering the huge directories to the homes of the famous and crazy in that star-studded town. At one address, he was ringing the bell when a hippie "who looked like a madman" stuck his fuzzy head out of an upstairs window. "What the hell you want?" he challenged Rick. "Phone books!" Rick replied, and the hippie's face brightened and he came running, shouting "Oh man! The phone book's here! The phone book's here!" Rick quickly found out he'd delivered Frank Zappa's phone book. Lord knows what chemically enhanced games were played with the directory. I know that my friends and I played geeky games of generating random names for role-playing games by picking, in the I-Ching manner, examples from the phone book and mixing examples from white and yellow pages. Names such as "Lorenzo Plumber" or "Scrap Metal O'Malley" resulted, to our geeky delight. "Waters difficult to keep within the Lake's banks: The Superior Person examines the nature of virtue and makes himself a standard that can be followed. Self-discipline brings success; but restraints too binding bring self-defeat." History of technology there? Tim Wu's The Master Switch, the text just completed in my course on The History, Culture and Future of Cyberspace, is all about those who establish standards for an entire industry, like Bill Gates, though not just for themselves. Some geniuses such as Steve Jobs foresee needs we don't yet have, and they push others to and past the breaking point to make the vision real and the consumer's need materialize. In the era of mobile technology, where most of my students carry area codes from faraway lands, there's no sense in a phone book. Discipline is needed, however; my students get so lost in a web of constant texts and other inputs that they do not give sufficient priority to e-mail about classes, and they suffer as a result. 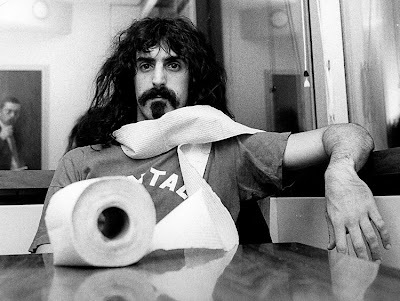 So as be blunder forward, without much direction or a good directory, into this connected era I will miss the nigh-sacred tome on the "telephone table" in my, and perhaps Frank Zappa's, dining room. Or, perhaps, another room in his hippie mansion. "...so old that a broom provides the interface for web access in their homes." Hee hee - although I confess I had to read it three times before I got it. Need more coffee. It's my operator error, Grizzla. How about "so old they access the web at home with a broom"? Scrap Metal O'Malley - priceless!